I know I mention all the time that Logan loves basketball and he tells me constantly he will play in the NBA one day....those are his words, not mine. I thought I would actually show you his words. 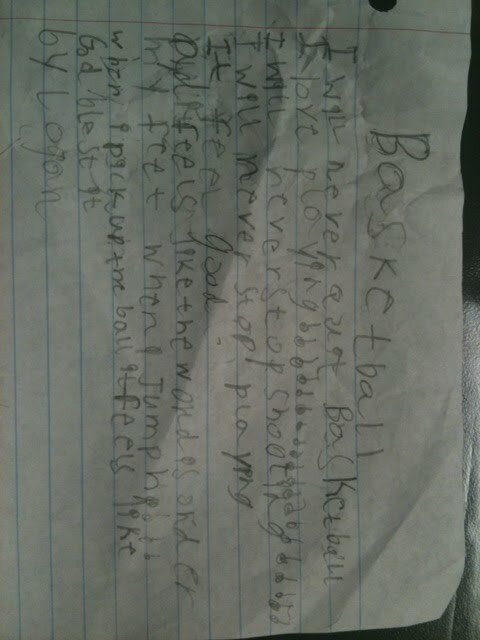 :) I came across this poem that he wrote as I was cleaning his room this weekend. Of course I got teary eyed when I saw it. I asked him about it and he got excited and wanted to read it to me and his daddy. Gene and I listened as he read it to us and just smiled at each other. It is hard to see since it is written in pencil so I have it below also...in his words. :) Enjoy! I will never quit basketball. I will never stop shooting. I will never stop playing. And I feel like the world is under my feet when I'm jumping!!!! When I pick up the ball it feels like God blest it. 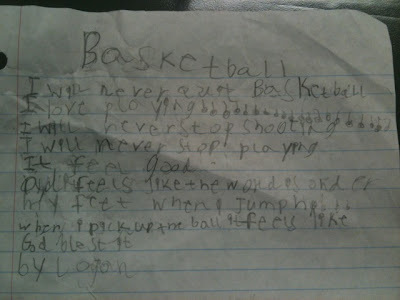 So to say this little boy loves basketball is quite the understatement of 2011! He wants to play for the Mavericks cause he loves them and he doesn't want me to have to travel too far to see him play....haha!!! This is a poem that I will cherish forever....he may not have spelled blessed right but he knew to capitalize the G in God!!!! So proud! May all your dreams come true boogie-o!!! We love you!! !